New steps to the old hound yards. 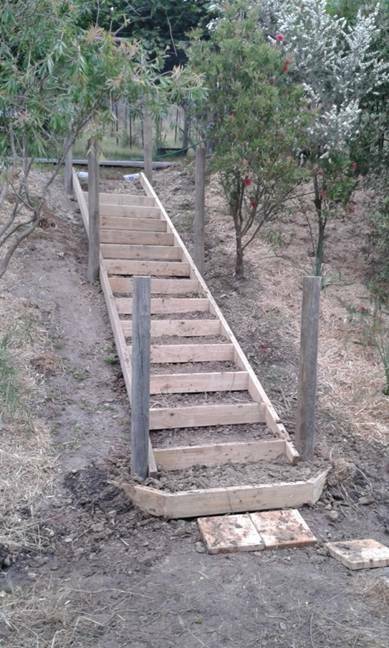 I have been building a set of steps at the back of the house. Still not finished. They would have been such a boon for me for around 25 years of all those winter’s nights as I led hounds down that wet, slippery slope (and back) to take them hunting the majestic sambar in our wonderful Gippsland mountains. Now (I am old), the hounds are gone and a garden is taking their place with over 100 trees already planted in their yards, and my wife and I will need safe access to them! When we have finished the steps (and tidied up the yards a bit more) you may be taken on a tour! Meanwhile the grevilleas with which we planted out the back slope (and which Della has been busily mulching today) are attracting lots of honey-eaters & etc. Yesterday while working on the steps in the heat, I counted four species of honey-eaters and a fantail enjoying them, as well as our usual resident wrens, wagtails, etc!